In October 1920 A.D., a congregation was held at Dharowal, District Sheikhupura for reform in Gurdwara Nankana Sahib in which the leaders revealed to the gathering of devotees, the misdeeds being committed inside the Gurdwara. Gurdwara Nankana sahib was highly revered as it is the birth place of Guru Nanak, a city named Nankana Sahib came up around the Gurdwara which is now in Pakistan. At meeting ,it was unanimously resolved that the Mahant be asked to mend his ways. When Mahant Narian Dass was asked to reform himself, he started making preparations to oppose the Panth (Sikh community) instead. He did not feel it necessary to pay heed to the suggestions of the Committee. He was the owner of the estate attached to the Gurdwara with an income of one hundred thousand rupees besides the offerings of the Gurdwara. The Mahant recruited hooligans and rogues as paid employees to oppose the Sikhs. With the help of the government, he collected from Lahore, guns, pistols and other arms and ammunition. He brought and stored fourteen tins of paraffin. He got the Gurdwara gate strengthened and got holes made in it so that bullets could be fired through them. The Government was using every available weapon to make Akali movmement of Gurdwara reform, a failure. Mahant Narain Dass was one of the weapons in the hands of the Government and the Government wanted to make full use of him. As such, Mr King, the Commissioner of Lahore was extending every kind of help to the Mahant and had promised him in the future as well. The Mahant was dancing like a puppet in the hands of the Government. In the meeting of Parbhandak Committee at Gurdwara Khara Sauda on 17th February, 1921 A.D., was decided that two jathas (squads) one led by Bhai Lachhman Singh and the other by Bhai Kartar Singh Virk (alias Jhabbar) should meet at Chander Kot on the 19th February. From there they were to reach Nankana Sahib early in the morning of the 20th February to talk to the Mahant. Seeing the preparation of the Mahant, the Parbhandak Committee held a meeting in the office of Akali Patrika (News paper) on the 19th February in which it was resolved that squads should not be taken to Nankana Sahib on teh 20th February. Bhai Kartar Singh Jhabbar was present in the meeting. He was informed about the new decision and was told to inform Bhai Lachhman Singh and he took the responsibility to do so. Bhai Kartar Singh Jhabbar immediately dispathed Bhai Waryam Singh to Chanderkot so that other squad could be stopped. Meanwhile in accordance with the original programme, Bhai Lachchman Singh reached Chander Kot on the night of the 19th February with his squad of one hundred and fifty Singhs. He waited for the squad of Bhai Kartar Singh Jhabbar for some time and before the arrival of Bhai Waryama Singh with news to not to led squad to Gurdwara, Bhai Lachchman singh said to the Singhs of his squad, "When we have started for a good cause, we should not waste time." All members of the squad agreed. Bhai Lachhman Singh got a promise from the squad not to strike and remain peaceful come what may. After that the squad prayed for their success of their nobel resolve. When, after, the prayer, the Squad was about to move forward, Bhai Waryam Singh arrived. He showed them the letter about the new decision of the Committee. Bhai Tehal Singh Said, "Dear Khalsa, we have taken our resolve at the prayer (Ardaas)and cannot turn back now. It is imperitive for us to move forward." The squad as a whole moved forward following Bhai Tehal Singh. The Squad arrived at Nankana Sahjib on 20th February, bathed in the pool and entered the Gurdwara at 6 A.M. Bhai Lachchma Singh Sat in 'Taabiya' (Behind Guru Granth Sahib). The Mahant had got the news of the squad's arrival at Chander kot on the 19th February evening. He had gathered his men at night and briefed them about their duties. After the squad had sat down, the Mahant signalled his men to carry out the predetermined plan. The Mahant's men closed the main gate and started firing from roof tops. Twenty-six Singhs became martyrs to those bullets in the courtyard while another sixty or so sitting inside the Darbar Sahib became targets of bullets. When the Mahant's men saw no one moving, they came down with swords and choppers. Any Singh they found breathing was cut to pieces. At the sound of the gun-fire, Bhai Dalip singh and Bhai Waryam Singh who were sitting in the factory of Bhai Uttam Singh, got up and rushed towards the Gurdwara. When the Mahant saw them coming, he shot Bhai Dalip Singh with his pistol while his men cut Bhai Waryam Singh to pieces. They threw their bodies into kils where other bodies were also burning. When no Singh with hair could be seen upto the railway line, the Mahant asked his men to collect all the dead bodies, pour paraffin and burn them. The body of one alive singh was tied to a tree and burnt. At 9.15 a.m., Sardar Uttam Singh conveyed the news by telegram through Sardar Karam Singh Station Master at Nankana Sahib Railway station to the Governore of Punjab, commissioner, Deputy Commissioner, Superintendent of police and Sikh centres. Deputy Commissioner, Mr. Curry reached at 12:30 P.M. while Commissioner, Mr. King arrived at 9.30 P.M. They arrested twenty PAthans and locked the Gurdwara. City was handed over to Army which cordoned it to restrict any Akali movement to take over Gurdwara. Sardar Kartar Singh Jhabbar arrived with his Squad on 21st February. Commissioner informed him that if he tried to enter city with his squad army will open fire. Kartar Singh Jhabbar and his jatha of twenty two hundred Singhs did not listed to commissioner and kept on moving towards city. At end, Commissioner Mr. Curry handed over the keys of Gurdwara to Bhai Kartar Singh Jhabbar. At 7.30 P.M. on the 22nd february, the bodies were cremated according to Sikh tradition. An urdu newspaper called 'Zamindara' wrote in its editorial of 23rd February, 1921 A.D., "what more proof of shamelessness of muslims is required than that they have helped the Mahant. O, Shameless Muslims, isn't the cup of your shamelessness and impudence full as yet? You used your guns and swords against those who went to Nankana Sahib to perform religious duties. You are not fit to be called Muslims. You are worse than infidels." Mahant, 20 Pathans and other of his group were sentenced by British. Only Mahant and couple of Pathans got death sentence for this crime of more than 50 murders. 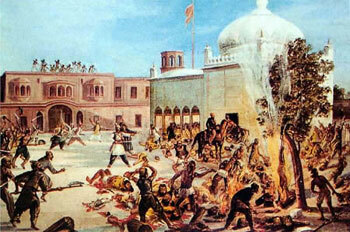 News of the Nankana Sahib massacre shocked the country. Sir Edward Maclagan, Governor of the Punjab, visited the site on 22nd February. Mahatma Gandhi, along with Muslim leaders Shaukat 'Ali and Muhammad 'Ali, came on 3rd March. Princess Bamba Duleep Singh, daughter of Maharaja Duleep Singh, came accompanied by Sir Jogendra Singh, to offer her homage to the memory of the martyrs.